Bertus Basson is my chef crush and I’m a fan of everything he does. Add to this busy culinary empire his frequent stints as TV cookery show presenter and judge (Ultimate Braai Master), freelance private cheffing, pop-ups at trendy events, mentoring and training staff, running award-winning, packed-to-the-rafters restaurants, being a good husband to beautiful wife Mareli and devoted dad to new baby son Theodore, proud companion to his trusty sidekicks Spek and Bone and good buddy to his mates and you pretty much wonder where he gets the time to do it all. And then write a cookbook as well. 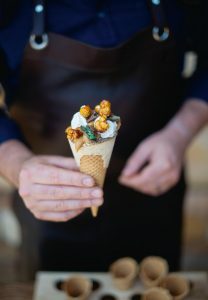 Not any old cookbook, either – Homegrown is a heartfelt ode to all things local, be that Boerekos, ‘the fantasticness of tannies’, melktert and koeksisters, snoekbraai and monkey gland sauce, fancy modern twists to traditional favourites like Hertzoggie Pavlova and Koeksister Ice Cream and above all, memories. 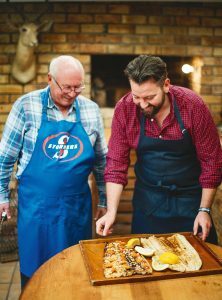 There are tributes to and recipes for quintessential local favourites like shisanyama, braaied mielies, peri-peri chicken, boerie rolls and gatsbys too! Fans of Fritz Schoon formerly of Schoon de Compagne will rejoice to find his ciabatta recipe here, too. 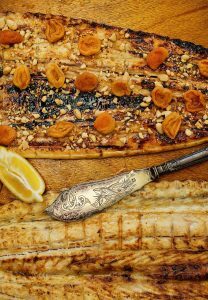 The book is awash with Bertus’s memories – of food, family, friendships and happy times. I literally got goosebumps at my first reading of the book and I’ve grown so attached to my own copy, I sometimes carry it around the house with me all day long. It’s marvellous to dip into for a quick read. If all else fails, Bertus can always become a professional storyteller. Homegrown is more than a collection of recipes, you see: it’s cookbook-as-friend. I really can’t think of a single person I know who wouldn’t love it. So there’s your cue – go out and buy 2, sommer, one for you and one for someone you love. This book is intensely personal, intimate even, yet suffused with a lighthearted playfulness and warmth throughout. What leaps off the pages are Sincerity. Tenderness. Generosity. Discipline. Honesty. And Mischief. Just like the man himself, really. The photography throughout is done by the legendary Claire Gunn, who captures Bertus, his food and his world with studied nonchalance. Like happy snaps, done beautifully and professionally. Roxy Spears’ design of the book is bang on the money, too. 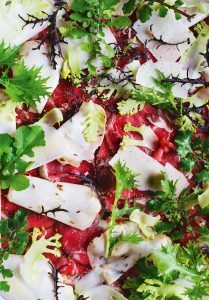 Bright colours, relaxed settings and vivid textures make the food come alive on the pages, inviting you to lean over and pick up a bite or two. I get ravenously hungry just reading the recipes! I urge you to pick this book up and page through it on your next visit to a decent bookstore. And I challenge you to leave the store without buying it, or least feeling a pang of regret that you can’t. It’s more than just a cookbook, you see: it’s a direct connection to something precious in our South African souls – the simple happiness that comes from making and sharing homegrown food. Five chapters, and every recipe a must-make treat. By kind permission from Jacana Publishers, I can share with you three mouthwatering recipes from Homegrown in the next few weeks. Here are some photos to whet your appetites! Homegrown is sold for R330. 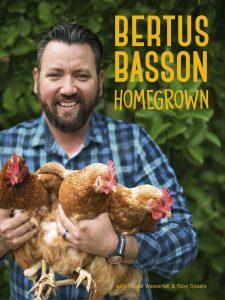 Ultimate Braai Master host and chef Bertus Basson shares recipes from his personal and national heritage in his first cookbook, Homegrown. The book is a celebration of being South African and how embracing his roots has influenced Bertus as a chef, as many of his signature recipes are inspired by his Afrikaans origins. 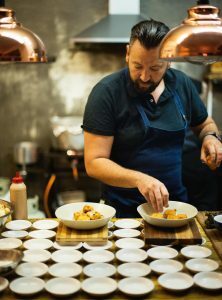 Homegrown also explores how other distinctly South African tastes and flavours have impacted his cooking, influencing his unique take on fine dining for his award-winning restaurants. Highly acclaimed South African chef Bertus Basson is famed for the phenomenal success of Overture, a restaurant he has had an integral part in establishing as one of the finest in South Africa in his position as a chef and owner since 2007. The picturesque Winelands restaurant has won several Eat Out top 10 awards, and is currently placed ninth. It has also been awarded three stars in the Rossouw’s Restaurant Guide for four years running. 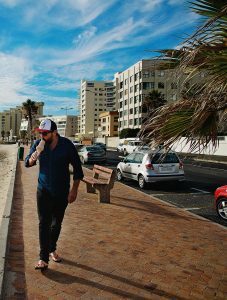 His other restaurants are Bertus Basson at Spice Route, Spek & Bone and Bertus Basson at the Ritz. His most recent achievement is becoming a judge on Ultimate Braai Master, the South African reality cooking show. Russel Wasserfall is a highly regarded food writer and photographer who has worked on or produced over 20 cookbooks. Roxy Spears is the owner of Good Design, which specialises in graphic design for food and restaurant branding, recipe books, packaging and food truck design. Claire Gunn is a photographer, chef, artist, blogger and stylist. She has photographed or contributed to the making of six cookbooks. 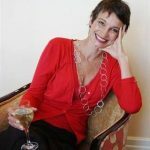 Her photography is regularly featured in South Africa’s top food and lifestyle magazines, newspapers, blogs and the like.